We are the Unknown Artists. We are asking for your help in fixing the broken gallery system that allows artists to be routinely ripped off and taken advantage of. The system that allows gallery owners to make millions while using unpaid interns. A system where artists are afraid ask for a contract and then worry that they will never be paid if their work sells. Please join us in our call to action against the notorious Los Angeles art dealer, Douglas Chrismas. Chrismas has recently opened a non-profit museum in Los Angeles called the Ace Museum on the corner of La Brea Ave and 4th. Douglas Chrismas has had well over 55 legal disputes with artists and collectors for financial fraud including stealing artwork and refusing to pay artists. A quick Google search will turn up countless examples. (We have provided links below.) Douglas Chrismas has lost lawsuits charging that he stole famous artworks, sold smuggled artwork while claiming it was ‘free and clear of claims’, failed to pay rent and taxes, failed to pay artists for artworks that he sold, and failed to deliver artworks to collectors. He has used bankruptcies to avoid paying claims on at least 7 occasions. One art collector had Chrismas arrested when his bankruptcy filing protected him from paying the money that he owed. Chrismas is currently being sued in a class action lawsuit for “failing and refusing” to pay artists 5% royalties on secondary market sales. Secondary market sales bring in millions of dollars of profit for dealers. Refusing to pay artists 5% for the work they made is clearly exploitative, selfish and greedy. Artists fought hard to win 5% resale royalty rights in California, but art dealers like Chrismas make this law useless. Douglas Chrismas’ disregard of artists is so legendary, he has earned a place in art history. Miwon Kwon, in her account of site specificity: “One Place After Another,” presents an account of Ace Gallery recreating artworks by Donald Judd and Carl Andre without their permission. Andre and Judd both publicly denounced these recreations as “a gross falsification” and a “forgery,” in letters to Art in America. Rebuild the Dream, MoveOn, Russell Simmons, SEIU, Occupy the Dream and Courage Campaign are planning on holding an event at Ace Museum titled: “All in for the 99%”. We have contacted Rebuild the Dream and asked them to not work with Ace Museum because of Christmas’ notorious reputation. Representatives from Move On and Rebuild the Dream initially responded by denying they were working with Ace and then claiming to only be renting the space and stating that they do not believe that there is any signage on the building that says “Ace Museum”. We presented them with images of their email explicitly stating that it was at Ace Museum and we told them about the museum’s 9 ft by 50 ft letters spelling out “ACE MUSEUM” on the front of the building. But they are still insisting that Ace Museum has nothing to do with the show. We are concerned that as Douglas Chrismas moves his practice of fraudulent dealings into the non-profit world, he is going to receive a massive amount of publicity from Rebuild the Dream and Move On as they bring people to his new establishment. People coming to the event are not going to know that Rebuild the Dream is renting the space and they are going to believe that Ace Museum is a place that stands with the 99%. Now is the time for us to come together against this gallery owner who has been mistreating artists for so long that he has gone down in art history for it. The time to do something is now! Artists everywhere must come together and let the art world know that we are not going to continue to let people like Chrismas blatantly take advantage of us. Ace has galleries in Los Angeles, Beverly Hills, New York, and Mexico City and now they are attempting to take their thievery of artists to the non-profit world. Also, if you have personal experience with Chrismas or Ace Museum, we encourage you to post comments to our blog or send your case to ArtLeaks. Please stand with us in solidarity against this terrible person and forward this email to every artist you know to join us in our struggle. If you have been harmed by Ace Gallery—speak out. We are artists, we must do what we do best to shame this institution from the art world. Post wheat-paste posters about Chrismas, make and distribute info graphics about Ace Gallery, make websites about Chrismas’ fraudulent business dealings, make paintings about Chrismas—whatever you can do to help us. This man is everything that is wrong with the art world, he fights artist’s contracts, he fights artist’s resale royalties, he uses unpaid interns while he takes his private jet back and forth from Los Angeles to New York, he recreates artist’s work without their permission! Artists are still struggling while gallery owners live luxuriously lifestyles at our expense! He is the person keeping you down! Artists of the world UNITE! P.S. PLEASE SHARE THIS WITH EVERY ARTIST YOU KNOW!!! Miwon Kwon, “One Place After Another: Site-Specific Art and Locational Identity” p. 39. Following Apple Via, MoveOn.org expressed support for the sign that was to be installed near the entrance of the Ace Museum stating their total independence from Ace. 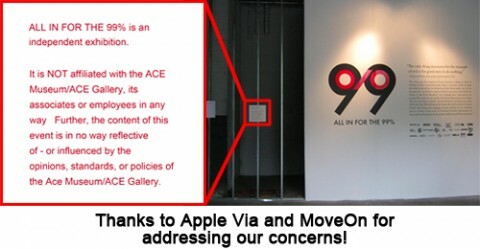 MoveOn thanked us for bringing this information about Ace Gallery/Museum to their attention and stated that they “honestly had no idea that there was any bad blood between the owners of this space and the rights of artists.” We would like to thank both Apple Via and MoveOn.org for addressing our concerns. The best news is that MoveOn.org also promised to make it a priority to do proper research next time. We feel that this should be a priority so that these organizations don’t end up working with those that harm the 99%. Thanks again to all who helped out! If we don’t take action about the economic conditions of the art world, who will?